Mid-1992, and former Q Tips vocalist, and more recently ‘pop star’, Paul Young called up some musician friends with the sole intention of having some fun playing Texas and Mexican Conjunto, or ‘Tejano’ music. At that time it could not be envisaged that 26 years later this ad-hoc band would have evolved into a permanent, serious project, still performing, and releasing, vibrant music of the best quality. 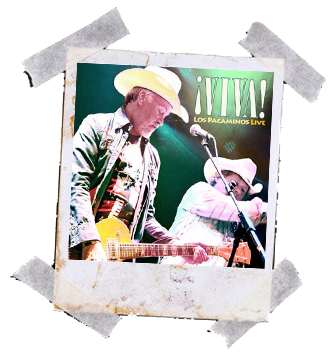 ¡VIVA!, their latest release was recorded live at The Warehouse, Harrogate previously unknown to me as a hotbed of Southwest American music, in September 2017, and what a formidably entertaining album it is too. Lest it be thought that the group is merely Paul Young’s Band, it would be apposite to correct that potential fallacy. 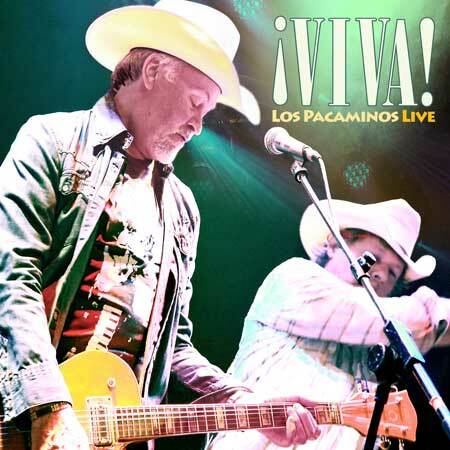 This is a tight band, comprising in-demand musicians of the highest calibre, all contributing greatly to the overall sound, and, as is clear on this album, showmanship that sets Los Pacaminos apart. 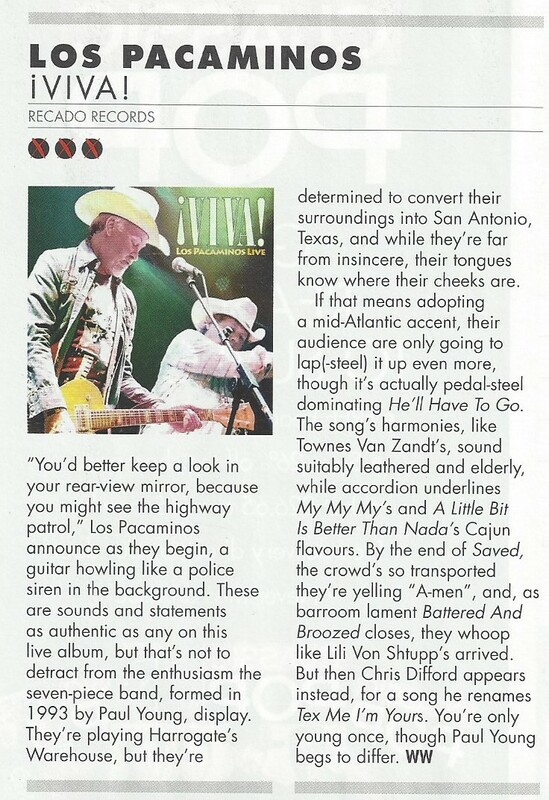 From the opening sirens of Highway Patrol, co-incidentally one of my favourite Junior Brown tracks, this ‘group ethos’ is apparent, with accordion, guitars and pedal steel swirling around vocals, no spotlight here on a ‘main man’. The closing whoops of appreciation from the audience give the impression that this was a special night, and judging from the music which follows that would seem to be more than a fair claim. Song choices on the album comprise a mixture ‘classics’ and band-composed, and include live versions of tracks from previous releases together with others that don’t seem to have appeared on earlier recordings by the group. The running order is another positive attribute, with variations in tempo, mood and atmosphere ensuring great variety and creating an ebb and flow which maintains interest for the listener. Poor Boys and My My My from The Early Years, the former always fondly reminding me of Dr Hook, both get an airing, whilst, as you might expect, Fistful Of Statins is also well-represented, with the highly infectious Girl From Tennessee, Caballero, Come A Little Bit Closer and a woozy rendition of Battered And Broozed also making the final cut. 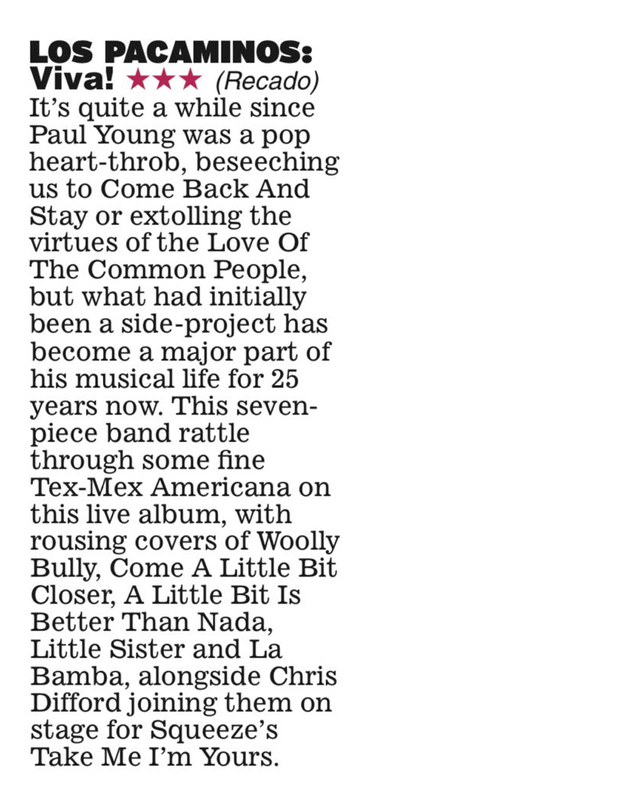 A cameo guest appearance from Chris Difford, an honorary Pac, is worth the entry fee alone, as Take Me I’m Yours gets a Texmex makeover, Tex Me I’m Yours indeed, complete with stellar pedal steel from Melvin Duffy. With cracking versions of classics such as Travis & Williams’ Smoke That Cigarette, Doug Sahm’s A Little Bit Is Better Than Nada, Allison & Allison’s He’ll Have To Go, Little Sister by Doc Pomus and Mort Shuman and John Mellencamp’s Teardrops Will Fall, not only are dues paid, but, perhaps more significantly, the arrangements and interpretations/re-workings serve to exemplify the sheer musical talent alluded to above. The overriding feature that one is left with after listening to this collection, however, is one of utter euphoria. As I write on a dull, dreary, November morning, any early-winter blues are dispelled by the happiness and celebration of life exuded by the music on offer. It is the sort of album which leaves you beaming from ear to ear and with an incessant urge to leave your seat, get up and dance. To unashamedly borrow, somewhat incongruously perhaps, from Sum41, ¡VIVA! is ‘all killer and no filler’. The Most Authentic Tex-Mex Band This Side of the Atlantic! Do I start with a History Lesson about how London Pub Rock in the early 1970’s begat not only Punk Rock, but what we now know as Alt. Country all around the world; or do I just pile straight into this fire cracker of an album? Let’s go for the latter shall we (I don’t want to bore or antagonise you)? 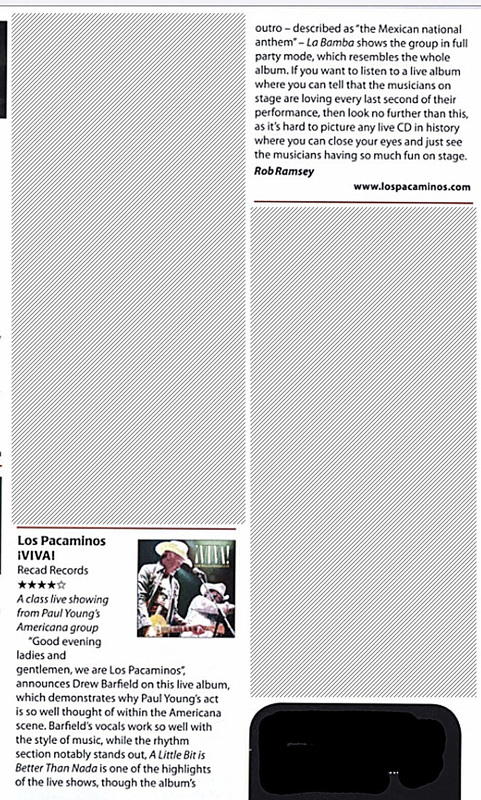 Los Pacaminos are often lazily billed as Superstar Paul Young’s band but they are so much more than that. If you check out the CV of each musician you will see they are something of a mini-supergroup in their own right and use this format to have a blast whenever they can get the band together. VIVA! LIVE! Is their fourth album and follows on from the immaculately titled A Fist Full of Statins from earlier last year. It really does showcase the best Bar Band in NW London at their very best, performing at a club in Harrogate, North Yorkshire, which is frequently compared to the border town of Tijuana, Mexico! The party, and that’s the best way to describe a Los Pacaminos concert, starts with a shady rendition of Highway Patrol and the whoops from the audience are 100% genuine and similar to the sounds inside my head as the guitars squeal and hiss as whoever is singing rumbles like a storm brewing in the dessert. That’s the beauty of Los Pacaminos, even though Paul Young was/is a bonafide Pop Star, he’s more than happy to share the spotlight with his band mates.As you would expect, the song selection is quite exceptional with Little Sister, A Little Bit is Better Than Nada and He’ll Have To Go all getting dusted off and gussied up for a night on the town. Even old nuggets like Smoke That Cigarette, the dazzling Come a Little Bit Closer and a favourite of Mama Magpie Edie, Wooly Bully, somehow sound as fresh as the day they were recorded over half a century ago by their originators. There’s even a Guest Spot from Honouree Pacamino, Senor Chris Difford who takes the lead on (the remixed) Tex Me I’m Yours which fits in like guacamole on a taco. And why no one thought of adding a slide and pedal-steel guitar to the original I will never know! There are also a couple of originals in here too alongside the Classics, but things move along so quickly and there aren’t really any song intros. The record cover misses these things out completely but I didn’t recognise Poor Boys or Girl From Tennessee although both are rip-roaring stonkers and quickly had me tapping my toes, swaying my hips and even miming along with their choruses, even though I’d never heard them before. And it’s the same with both songs that became RMHQ Favourites after only two sittings. Both Battered And Broozed and Our Favourite Things could easily have been something the Blasters or Fabulous Thunderbirds would have played to a smoky and packed cantina somewhere sleazy and hot, ‘back in the day’…. Perhaps they did, in which case I bet it was a great night there too! In many ways there’s ‘nothing new’ here; but that misses the point completely this is an album and indeed audience paying homage to a cool genre of music (Tex Mex/Tejano) that has been airbrushed from the Americana History books in recent years; but still makes for a cracking good night of happy songs, dance tunes, love songs, break up songs and especially drinking songs when done as well as this.